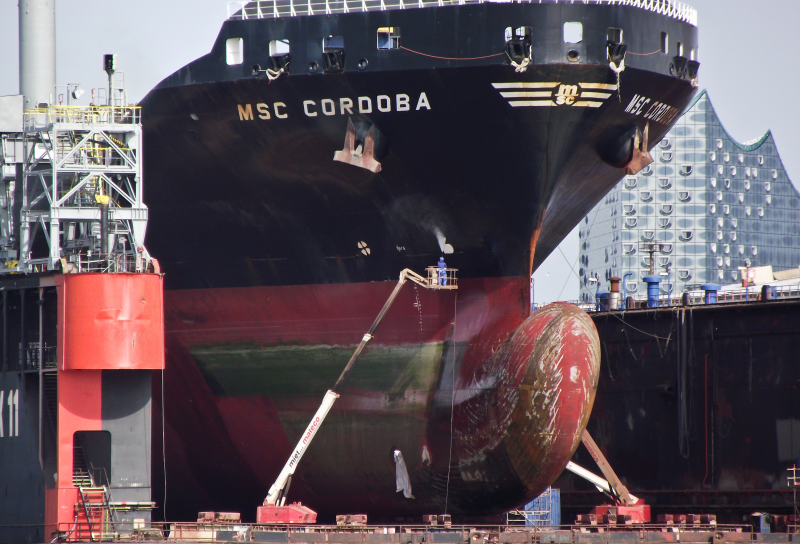 Close-up of "MSC Cordoba's" bow section with bulbous bow & thrusters. Dry-docked at Blohm&Voss dock 11 for extensive repairs including works on rudder, screw propeller and container holds as well as paint works and engine maintenance. Spotted from a harbour ferry on 5.08.2015. ...now I fixed the bow se/uction. I'm sure, the workers at the dockyard did the same for real. Thank you for your hidden hind and your nice comment. "Close-up of bow suction ......."
Now that's a close up David! With the size of the worker to put size in perspective. Good one! !